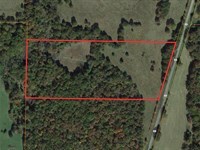 Come see this beautiful 25 acres for sale on Big Creek and with Spring River access just south of Mammoth Spring, Arkansas in the heart of the Ozarks. This property, located within the Riverside Resort area on the Spring River, has access to the amenities of the Riverside Park including Access in and out of the park, access to Spring River to swim, fish, and float, Boat launching, bringing friends for a camp-out, and much more. 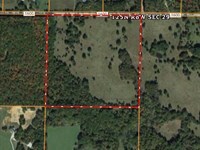 The property itself has about 6 acres of open hay-ground, and the remainder in big, open timber. It is bordered by the gorgeous year-round Big Creek which flows into the Spring River. 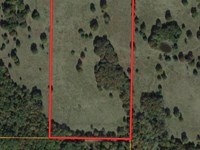 Build your dream home here, or use it as a camping getaway. If you are a fisherman, owning this property will give you access to fish some of the best fishing in the state of Arkansas on the Spring River. Restrictions apply to keep property values high in this area. Come see this fantastic property. There are very few like it. Directions From Thayer, take 63 South 5.5 miles to a right on featherstone rd. Stay straight onto Riverside Dr. Take riverside all the way to T by RR tracks. 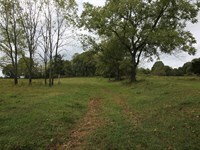 Turn left, cross big creek, property on right. If you liked this listing then check these out. On average, there are 215 sunny days per year in Mammoth Spring zip 72554, Arkansas. The July high is around 90 degrees. The January low is 24.Mammoth Spring, Arkansas, gets 46 inches of rain per year. The US average is 39. Snowfall is 3 inches. The average US city gets 26 inches of snow per year. The number of days with precipitation is 70. It is the mission of the Mammoth Spring School District to educate all students. We will provide a relevant and challenging curriculum for each student which will promote higher level thinking skills, develop working skills in technology and enhance problem solving ability, so that students may become more competent in an ever changing world. Ozarks Medical Center is a system of care encompassing a 114-Bed acute care hospital, 8 primary care and 15 specialty clinics, along with complete rehabilitation and home care services. We are a it medical referral center with over 1100 employees, serving an 8-county area in south central Missouri and north central Arkansas. North Arkansas Electric Cooperative was incorporated in 1939 and just one year later, on June 6th of 1940, energized its first line. As an electric cooperative, Naec is a private independent electric utility incorporated under the laws of Arkansas. We are owned by the members we serve and governed by a nine member board of directors elected from the membership, which sets policies and procedures that are implemented by the cooperative's professional staff. North Arkansas Electric Cooperative is one of seventeen distribution cooperatives located in Arkansas. Ranked 5th in the state, Naec serves approximately 36,000 member accounts in Northern Arkansas. With over 4,500 miles of power line and 27 different substation sites, North Arkansas Electric Cooperative provides electric service in parts of seven different counties. North Arkansas Electric Cooperative is headquartered in Salem, Arkansas and operates two other full service offices located in Ash Flat and Mountain Home. Fidelity Communications- Cable television, home phone, and high speed internet. Century Link- Home phone, high speed internet, and dish network Television. The closest airports to mammoth Spring are the Springfield- Branson National Airport 147 Miles, Memphis International Airport 160 Miles,Little Rock- Clinton National Airport 155 miles, and Lambert-St. Louis International Airport 236 miles. Jonesboro, Arkansas- Jonesboro, one of the state's most progressive cities, was established in 1859 among the rolling hills of Crowley's Ridge in northeast Arkansas. Downtown is filled with gift shops, restaurants, art galleries, a day spa and an active civic center called the Forum. Arkansas State University offers one of the mid-South's finest museums, a fine arts center and an indoor sports/entertainment complex. The Forrest L. Wood Crowley's Ridge Nature Center provides an interesting tour of the natural wonders of the region, plus serves as a stop along Crowley's Ridge National Scenic Byway. Memphis, Tennessee- Memphis is a pilgrimage for those wanting to visit the birthplace of the blues, of soul and of rock 'n' roll. On Beale Street, W.C. Handy put down on paper the first written blues music. Elvis, Roy Orbison, Jerry Lee Lewis and Johnny Cash all recorded at the historic Sun Records, which is now a museum. Graceland, the second most-visited home in America, welcomes visitors from around the world who yearn for a peek into the life of the King. Beyond the music, Tennessee's largest city also offers much more. It has more sunny days each year than Miami, and combines southern tradition and hospitality with modern amenities. You'll enjoy great dining be sure to sample the barbecued ribs, art galleries and exciting nightlife. Springfield, Missouri- With more than 440,000 people in the metro area, Springfield is where the rolling hills of the Ozarks plateau form a surprisingly modern and green city. A big, small town, Springfield offers a great blend of fascinating attractions, historical treasures, sports excitement and cultural and leisure activities in a welcoming environment.The city offers 102 parks, including a linear trail system that integrates with the city's growing on-street bike route system an airport an art museum a zoo the Springfield Lasers professional tennis team the Springfield Cardinals minor-league baseball team and is home to Bass Pro Shops, Missouri State University, Drury and Evangel universities and the Assemblies of God Usa. Branson, Missouri- While visiting you can attend star-studded performances at Branson's many live shows enjoy Silver Dollar City, one of the world's top theme parks take in the beauty and adventure of the Ozark Mountains and three pristine lakes play some of the best golf in the Midwest visit museums highlighting the area's rich history and culture relax at spas and resorts and shop at Branson's many boutiques, galleries and outlets. Located in mammoth, a Clear spring fed river with long pools and whitewater falls. Exceptional trout and walleye fishing, canoeing, kayaking, boating, swimming and much more. Mammoth Spring is Arkansas's largest spring and the second largest spring in the Ozark Mountains. A National Natural Landmark, the spring flows nine million gallons of water hourly. Forming a scenic 10-acre lake, it then flows south as the Spring River, a popular Ozark trout and float stream. Located near the spring, the park's 1886 Frisco depot will take you back in time to an early 1900S train station. Parked just outside the train station is a Frisco caboose to explore, too. Eleven point River- Located 10 minutes From Alton. A Beautiful Scenic River perfect for Conoeing, Kayaking, boating, swimming, Fishing, and so much more. a 22,0000 Acre lake located in Mountain Home, Arkansas. Home to a variety of fresh water game fish. Boating, water skiing, ping and swimming are all extremely popular on the lake. The largest lake in arkansas. Covers over 94,000 acres. Known for bass fishing, water sports, boating, swimming, and camping. Mark Twain National Forest has a wide range of popular recreation opportunities. The forest has over 750 miles of trails for hiking, horseback riding, mountain biking, and motorized use. Sections of the Ozark Trail wind through the forest. More than 350 miles of perennial streams, suitable for floating canoeing and kayaking, meander through its canopied expanses. Our campgrounds offer visitors a variety of forest experiences, including semi-primitive and wilderness camping for solitude. 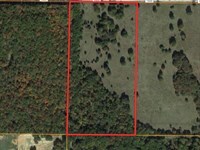 The area consists of 23,763 acres of rugged, forested hills and hollows.This area is predominantly forest with nearly 1,500 acres in glades, along with quality woodland, cropland and some wetlands. Facilities/features primitive camping, picnic areas, firearms range, viewing deck, two deer/turkey blinds, one intermittent stream and four Natural Areas Grassy Pond, Goldenseal, Stegall Mountain and Mule Hollow. There is a 10 mile self guided tour for elk viewing.